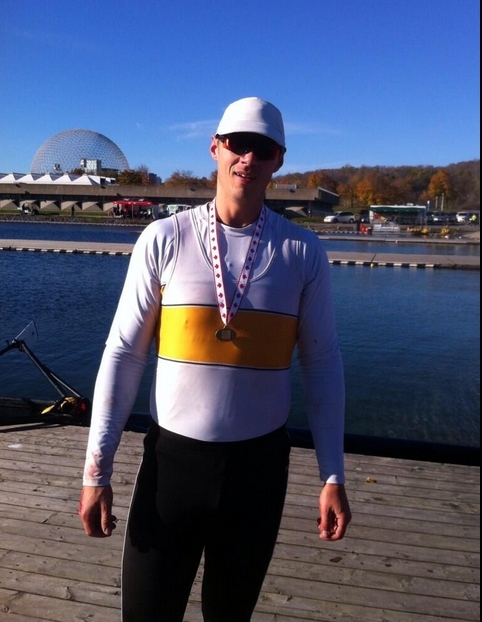 Winnipeg Rowing Club member Kevin Kowalyk earned top spot on the podium at the Canadian University Rowing Championships (CURC) this past weekend in Montreal. Racing for the University of Manitoba in the Men’s 1x event, Kevin won the A final and Gold medal in very rough and windy conditions. Loch Inglis and partner Riley MacCharles, as well as Ashley Olson and Ashleigh Milani raced in the Men’s and Women’s 2- events respectively. Loch and Riley won the B final, and Ashley and Ashleigh finished 3rd in the C final. University rowing in Canada is overseen by the Canadian University Rowing Association (CURA). The purpose of the association is to promote and act as the governing body for rowing programs at accredited universities and colleges throughout Canada. CURA also organizes the annual championship regatta, while recognizing the jurisdiction of Canadian Interuniversity Sport and/or Rowing Canada Aviron. McGill University hosted the annual regatta on the Olympic Basis in Montreal.